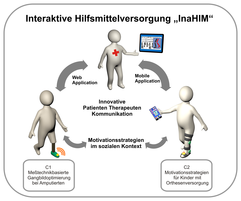 Interactive supply of aids "InaHiM"
The interactive support of patients with medical aids´ supply for the restoration of mobility can be divided into many treatment phases. 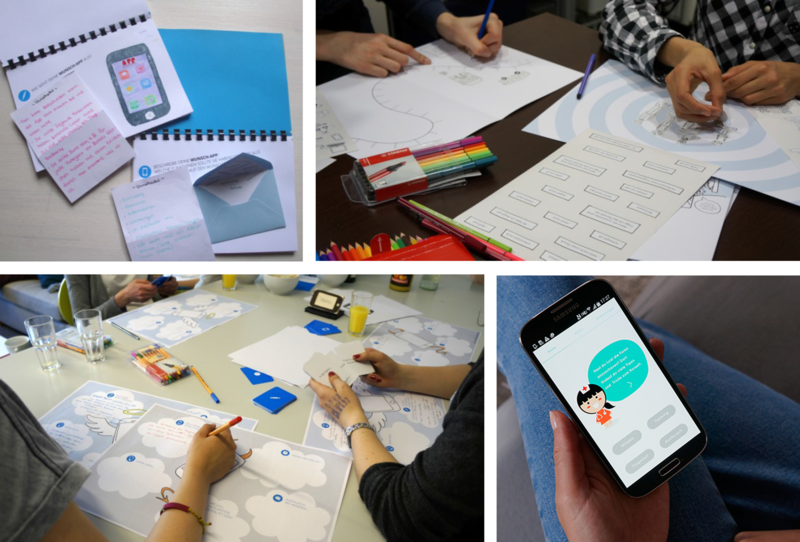 At the beginning of care, a precise diagnosis of patient's needs and the individual adaptation of medical aids should be supported by developed demonstrator modules. In addition, an interactive care of patients using medical aids is necessary, so that the optimal care support is provided at home and patients can reach their rehabilitation goals. Modern exoprosthetic knee joints are state-of-the-art medical devices that regulate stance and swing phase resistance by means of electronic sensors and complex control algorithms. Hence the user is able to walk safely on uneven surfaces, change walking speed and gait pattern, and rely on a stable prosthesis in stumbling situations. The correct alignment of all parts of the prosthesis is of central importance to enable full performance of the artificial leg. Additionally misalignment forces asymmetrical stress of the musculoskeletal system. Increased biomechanical stress of the residual leg induces degenerative processes in its joints. Today alignment optimization is based on static measurements during stance and the expert knowledge of the prosthetist who is conducting the dynamic optimization. But every single user has individual preconditions and not all alignment related issues are visible to the naked eye. Hence a wireless gait analysis system for lower limb amputees (Figure 1) was developed within the BeMobil Innovations Cluster involving prosthetic researchers, manufacturers and suppliers. The gait analysis system for lower limb amputees assesses dynamic gait parameters during the alignment optimization process and gives first guidance for necessary changes in the prosthesis alignment. 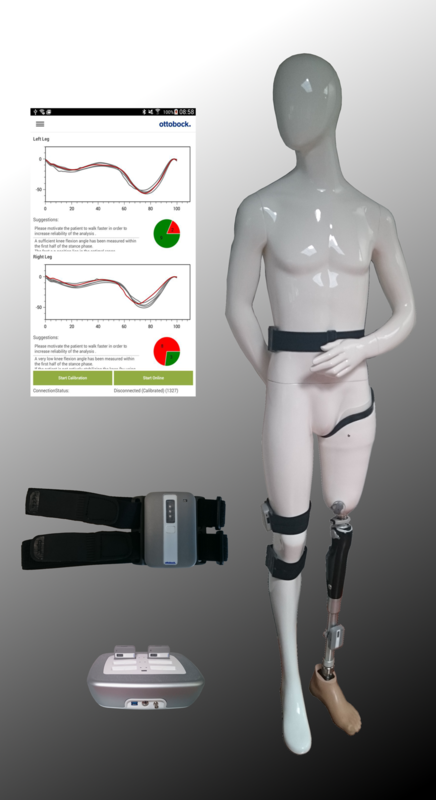 It uses inertial measuring units on body segments, a 6DOF-force-and-moment-sensor for fast integration in the prosthesis and a 3D-force-insole for the contralateral leg. All measuring data are transmitted to a tablet app with real-time visualizations and automated analysis functions. 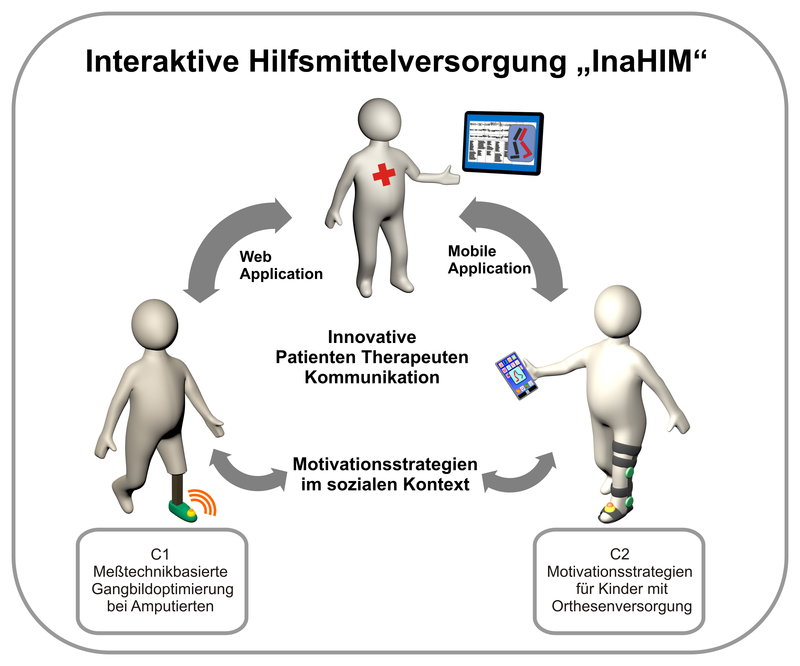 Aim of this project is to improve the therapy motivation in the continuous orthotic treatment of children and adolescents by means of a comprehensive, user-friendly design of human-technology interaction. Medical aid´s requirements for the special needs of children and adolescents are examined and the corresponding recommendations for the product development are derived. Requirements for a therapy support with motivation-promoting elements contained e.g. playful applications and virtual realities. The goal is to explain younger patients the necessity of therapy, so that they focus on the advantages not only on current disadvantages. They get a feedback about therapy success, are informed about the progress of the therapy and are actively involved in the treatment (empowerment of the patients). From numerous research findings, it has already been shown that giving monitoring and information to patients about their therapeutical behavior can improve therapy adherence. The sensor selection for the monitoring of therapy behavior is based on the medical indications. The technical challenges for sensor technology are also the necessary robustness (avoiding defects due to microclimatic parameters, cable breaks due to alternating stress), energy consumption (small energy storage, longer supply time) and safe data transmission to the mobile communication system (failure safety and availability). In addition, there are technical challenges to be innovative addressed with regard to the limited transmission power, communication bandwidth, data security, computing power and miniaturization of sensors.